Experts at the Vietnam Future Market 2016 Summit organised by Vietnam Supply Chain shared common views for the bright future of Vietnam economy and expected that Vietnam market in the coming years would be exciting, challenging and fast growing. Rural consumer base is another key driver for future market as the urban market is becoming more saturated. While the supply of logistics facilities and developments of infrastructure is increasing, the quality issues, such as road safety and suitable configuration still persist. Trans-Pacific Partnership (TPP) is another important factor affecting the future landscape, and it is to be noted that while TPP is beneficial to Vietnam, there is still a lot of preparation needed before Vietnamese firms can reap its benefits. Vietnam consumers are at the transition phase between traditional and modern, technological savvy lifestyles, giving opportunities for e-commerce and modern retail businesses. Vietnamese consumers remain optimistic of the future, despite the increasing cost of living. Consumer confidence index record the highest level in Q1, 2016. However, although optimistic, Vietnamese consumers remain conservative in their spending and focus more on spending that help securing the well-being of their families. Vietnamese consumers on average spend 10-12 per cent of their salary on children education, and the pharmaceutical industry records 20 per cent year-over-year growth, with household products seeing an upswing in spending. FMCG is becoming saturated at two to three per cent annual growth. Convenience and modern trade will see tremendous growth in the coming years as preferred shopping places (300 per cent convenience channel growth). The growing awareness in food safety & hygiene will make consumers become more cautious in choosing shopping places and consequently switching to safer channels. Promotion is likely to remain a big factor affecting consumer-buying decision. Comparison among supermarket operators show that Saigon Co.op and BigC stands together as having best offers for consumers, while VinMart and FamilyMart have the best offers among operators in the convenience channels. Consumers are spending more time on smartphone and internet devices than on television and traditional media. As 77 per cent survey respondents have used smartphones and 57 per cent of whom spend three to four hours/day using smartphones. However, although consumers are watching less TV, annual TV advertisement spending remains high at US$1.7bn (90 per cent total advertising spending, with 10 per cent year over year growth). The underlying reason for the high TV advertising spending as speculated is that advertisers and companies are still unfamiliar with digital advertising and is spending on habit. But the inevitable trend for advertising in the future will be digital as the younger generation move up and become the majority in the consumer base. Free trade agreement and the effects of TPP to the Vietnam economy is another key topic covered during the discussion. While TPP will be good for Vietnam economy, it will be very challenging for SMEs to reap its benefits as the rule of origins requires good record keeping practices, which are generally poorly managed by local SMEs. Minimum five-year documentation of origins retention is required by TPP. Obligations to environmental compliance are another key challenge as noncompliance behaviours become liable for punishment, and tightening of the laws makes exploitation more difficult. SOE will need to comply with nondiscriminatory rules, and in general, all businesses in Vietnam will have to comply with the intellectual property, trademark & copyright protection. However, it is important to note that while TPP effectively eliminates the tariff barriers to trade, another big issue for Vietnam is still the non-tariff or technical barrier to trade, such as product quality and compliance. Cross border e-commerce and digital services will also exploit the benefits of TPP. It is important to note that the non-duty condition is a staging implementation that can take 10-15 years depending on products. Therefore, it is an opportunity for developing countries, such as Vietnam, a chance to prepare to upgrade logistics and supply chain. TTP is expected to increase export of manufactures by 34 per cent, import of consumer and production goods by 27 per cent, create more confidence for FDI and stronger link to the international supply chain. Increased productivity resulting from competition pressures and momentum for reforms will boost growth and opportunities. To touch on the e-commerce sector, it is highlighted that although there are many challenges and issues with the e-commerce sector in Vietnam, the future will be positive. Vietnamese consumers have strong wish for value for money, variety of choices, shopping experience, but generally lack of trust in products. 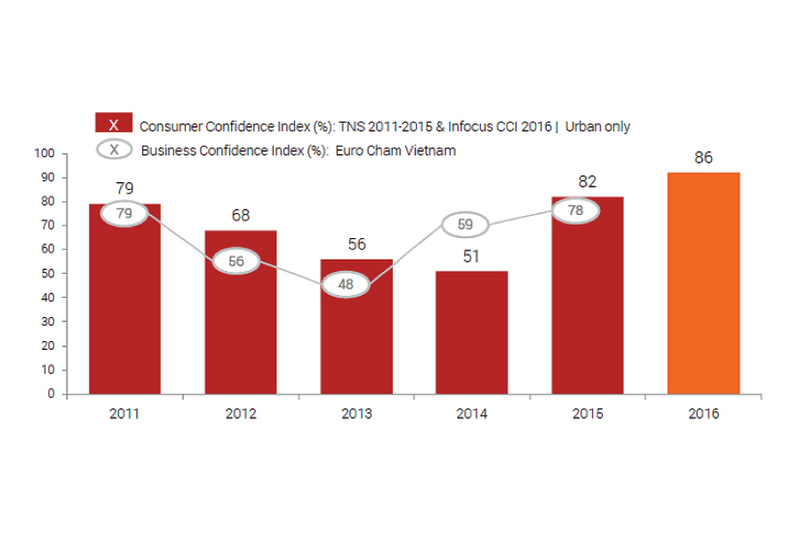 Trust is very low for e-commerce in Vietnam, similar to the US 20 years ago. However, there has been a significant increase of trust in the last four years. Price is still the key driver for e-commerce shopping, while convenience is not as critical as it should be. e-Commerce businesses are looking at how to serve rural consumers better, as they see that rural consumers will be the ones who will receive the most benefits from e-commerce as they will have more options and accessibility to products otherwise not available to them. The development challenge for e-commerce businesses is how to fully sync the shopping flows (buy anywhere, return anywhere). Delivery-wise, motorbike with the high flexibility and suitability to the urban landscape will continue to be the main type of delivery vehicles. The importance of the rural market is also paramount, and as the current speed of rural development is too slow for e-commerce, many e-commerce businesses have to develop their own logistics network spanning key provinces and cities in Vietnam, and perhaps much more in the future. Experts also agreed that rural areas will be more and more important for Vietnam. Large companies should be the pioneers to invest and build the market in the provinces. Julien is the Founder and Managing Partner of CEL Consulting, the first international Supply Chain and Operations consulting firm in Vietnam. He is now managing a team of consultants who is fully involved in providing their expertise to procurement, manufacturing and logistics related businesses in the region. Being credited as one of the pioneers in Vietnam Supply Chain, he is also holding important positions in the two other reputable economic organisations: Co-founder of Vietnam Supply Chain Community and Vice President of French Chamber of Commerce Vietnam (Ho Chi Minh chapter).